Our great founding principle was resistance to corrupt tyrants, like Boehner and Obama, and adherence a to the Constitution and to the rule of law. Boehner has now dropped his mask completely and put himself squarely on the side of Obama’s sedition. The Republicans are now using the principles of cultural Marxism to justify their plan for immigration reform. Do the Republican’s even know what the founding principles of America are, anymore, or do they just not care? The statement below from the “GOP principles” is rather a concept of social justice (cultural Marxism) than a concept on which America was founded. Actually, all totalitarian ideologies base their arguments on their own form of “social justice,” not just Marxism. So, we might just as well call it “cultural totalitarianism,” the government subverting the rule of law in order to support some unspoken agenda. Is Boehner’s nanny state now supposed to make right the mistakes of all the parents in the country. If so, why are they just helping illegal aliens and not the American children of parents who have made mistakes that have somehow impacted their children’s lives adversely? There are many children of Americans, who have suffered due to the actions of their parents. Sending illegal aliens back to their home country is not a punishment in any case. Why should Americans have to suffer loss of sovereignty, from no fault of their own, just because the Government has maliciously allowed a massive invasion and colonization of the country to take place. The Republican leadership does not care about these illegal aliens or American citizens. They only care about promoting more illegal immigration, in order to create a pool of cheap labor and compliant voters for their string-pullers. 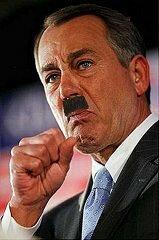 Boehner, Obama and others are undermining and selling out the sovereignty of the US and, in their own way, they are more dangerous than Hitler was to us, because Hitler had little chance of ultimately destroying our sovereignty. Boehner and Obama have a pretty good chance of doing that via this massive Amnesty and the future mass illegal immigration that it would encourage, shifting the balance of political power in the US forever to progressive socialism. They both should be tried and punished for their treasonous acts. If we wait until they destroy America before we react, it will be too late.